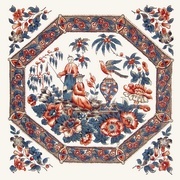 We are live with all 5 images of the elegant Chintz Center Panels! The colors are historically correct and details are exquisite. My panels arrived today and they are BEAUTIFUL! Thank you Margo.